Move over Scooby-Doo, there's a new Great Dane in town who's solving trouble. Her name is Wendy and she's half of the social media phenom Team Hunter & Wendy. The other half, of course, is Hunter VanBrocklin, a very active fifth grader who enjoys school, sports and hiking in spite of having Cerebral Palsy. It seems that nothing can slow Hunter down, due in part to pure kid energy and determination, but also due to Wendy, his mobility service dog who acts as part crutch, part mama bear, and part partner in crime for a big, full life. We talked with Hunter's mom Kelly VanBrocklin about their story. OLLIE: Can you tell us about how Wendy came to join your family? VanBrocklin: We have always figured out ways for Hunter to do whatever he wanted, but walkers were not great at "four-wheeling" outside. 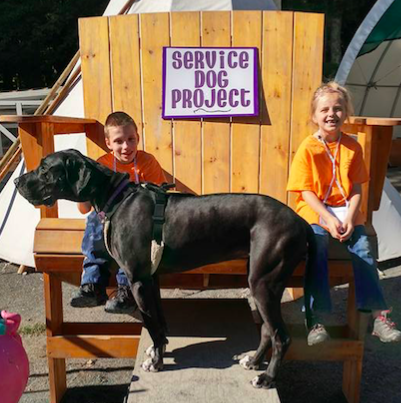 Once we heard about mobility dogs, we found Service Dog Project. We arranged to visit, knowing that Hunter was likely too young. Hunter chatted with the founder, got a tour, played with the puppies and we were told to fill out an application. We anticipated about a two-year wait but about two-and-a-half months later, they called to say there were a few dogs who loved kids that they wanted to try with Hunter. They introduced him to an almost-11-month-old Wendy. They were together a short time and bonded quickly. After a second day of bonding, the staff lined up and said, "Do you have dog food? You can take Wendy home for the night." Since that day, October 13, 2013, Wendy has been with Hunter. OLLIE: What kind of training did Wendy have before being paired with Hunter? VanBrocklin: Wendy was fully trained in general mobility. This included commands like "stay," "whoa," "wait," "walk on," "one step," "brace," and up and down stairs. They move on to leash training and are taken into the community. Some stay for overnights with volunteers for socialization. Some dogs even go to college classes with volunteers. The dogs are trained to follow their person's feet for pacing. Wendy was able to assist Hunter off of the floor using "brace," so Hunter didn't need to crawl to a chair to help him or waste energy getting to a standing position without assistance. OLLIE: How is Hunter's life different today from how you might have anticipated when he was younger? VanBrocklin: Because of Wendy, Hunter is so much more independent. With Wendy as his "four-wheel drive," he can navigate all terrains, from snow and ice, to sand and hills, all much more easily. We were told by his doctors that they didn't know how he was walking (with the severity of CP in his legs) and that he would probably be in a wheelchair around age 7. We knew that as Hunter got bigger, it would be more difficult for him to move his body, as his muscles were not strong. Because he could not cheat with Wendy like he could with his walker, Hunter became stronger, and his walking improved. Because of Hunter's determined spirit and Wendy, he surpassed what his doctors thought he could do, including walking without assistance and dramatically decreasing his falls. Hunter has gained confidence in his abilities. Instead of being in a wheelchair after his major surgery, Hunter is continuing walking with Wendy, and at a much faster timetable than what was anticipated. Everything is easier with Wendy for Hunter. OLLIE: Can you describe their relationship? VanBrocklin: They bonded very quickly, which you cannot teach or fake. If the bond is strong, the dog can be taught what the person needs. Wendy would sleep on Hunter's bed...actually on Hunter's legs before his surgery. We built her a special bed when Hunter had surgery, so that she could still be with him. They go to school everyday together. The only time they were ever separated was when she returned to the farm for a couple days of specialized training, and she just wiggled with excitement when he picked her up. They are really inseparable. When Hunter is playing and does not need Wendy, she must be in a spot where she can see him. All teams have their bond, but we think that since Hunter was only 7 and a half and small when they were matched, Wendy may be more protective, being a female, and is always on duty, even when her pack is off. OLLIE: Sometimes you write fun updates from Wendy's point of view. If she had the ability to talk, what would you want to ask her? 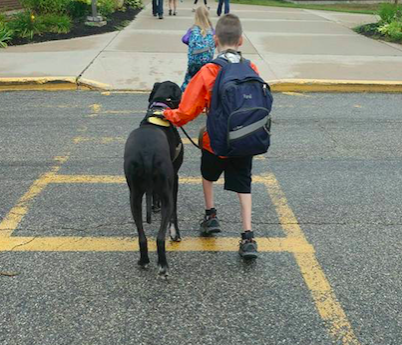 OLLIE: What makes a Great Dane like Wendy such a good service dog for the mobility impaired? VanBrocklin: Great Danes are great sleepers, which is what Wendy does at school. They are big dogs and are less likely to get hurt helping their person and Wendy really physically works hard at times to help Hunter. Danes have short spurts of energy, which we call "zoomies," but otherwise are very laid back. They are very smart dogs and understand language of what a two to three-year old toddler does, and we have found that Wendy is very intuitive and has helped Hunter without him asking, like when he misses a step going down stairs. OLLIE: Describe the perfect day for Hunter and Wendy. VanBrocklin: As long as they are together, and it's not raining or near water, they are happy. (Wendy is not a fan of any water.) They love to be outside in the fall, because neither likes the heat. Wendy wants to be working next to Hunter, like when they hike, because the hardest thing for her to do is watch him moving around without her. The perfect day may include being outdoors, maybe hiking, with lots of treats, stopping by their favorite ice cream shop, and having Wendy be able to visit the farm where she grew up to run and play with her doggie friends, with the night ending with cuddles in bed. OLLIE: What have Hunter and Wendy taught you personally about ability or about life in general? VanBrocklin: Hunter and Wendy have a "can do/we'll try" attitude, even when things are hard. Together, they can try everything and achieve most. Most of the time, Hunter has an infectious smile, that has only gotten bigger because of Wendy. Hunter makes the best of situations and knows how to laugh at himself. We know that Hunter is always with his best friend, who is there when he needs physical help, or just needs cuddles on a hard day, since nothing is perfect. We are amazed at what an inspiration they are to people all around the world via their Facebook page at such a young age and love seeing them grow up together. 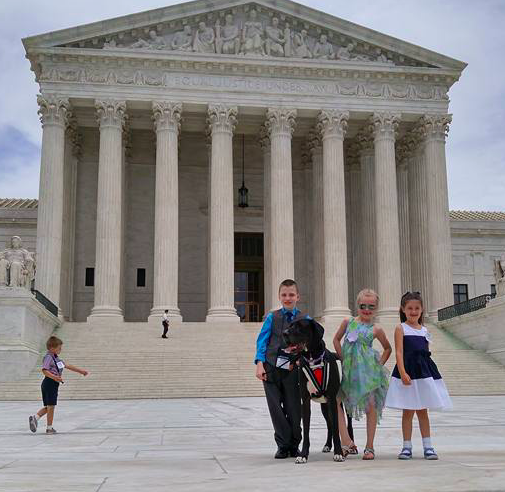 OLLIE: Hunter and Wendy recently took a trip to Washington D.C. What was the purpose of the trip? VanBrocklin: Hunter and Wendy were asked to represent Boston Children's Hospital at Family Advocacy Day this past June. They had meetings scheduled with all the Maine senators and representatives asking for them to support the ACE (Advancing Care for Exceptional) Kids Act and to thank them for supporting Children’s Hospitals Graduate Medical Education program. The ACE Kids Act is a proposal to help improve care for children with complex medical conditions on Medicaid. The hope is that it will improve the coordination of care to reduce the burden on families, address problems of families who need to cross state lines for care and potentially it could save a lot of money. We live in Maine, but are lucky enough to receive treatment for Hunter's complex spastic diplegia cerebral palsy in Massachusettes because we have private insurance, but have issues when accessing his Medicaid as a secondary. So far, three out of the four people Hunter met with have now co-sponsored the ACE Kids Act. OLLIE: How can others help support the cause? VanBrocklin: We encourage everyone to email their representatives and senators to co-sponsor this act, as it will help medically complex kids all over the country get specialized treatment from children's hospitals, which they may not be able to get otherwise. Children's hospitals need to ask for their funding every year, unlike regular hospitals that are allotted funds every year without asking. CHGME provides funding to independent children’s teaching hospitals to support the training of pediatricians and other residents. The idea is that these people that are specially trained at these hospitals then spread out throughout the country to help kids just like Hunter. Keep up with Team Hunter & Wendy on Facebook!